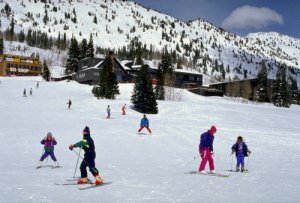 We provide transportation in our van for you and your children to Alta’s Albion Base for Alta Day Care and Children’s Ski School at 8:45 a.m. daily. Please sign up at the Front Desk by 8:00 p.m. the night before to use this service. We will also pick up your children at 4:00 p.m. if you notify us that morning. You will need to authorize the Alta Children’s Center in order for us to pick up your child without your presence. There is also a free Alta shuttle bus that stops at both the Albion Base and the Alta Lodge; it runs every 15 minutes from 9:00 a.m. to 5:00 p.m. Additionally, there is an easy transfer rope tow (between the Lodge and the Albion Base) for kids who can ski.